Is your organization experiencing some of these symptoms of unengaged members? I've seen some nonprofits avoid these symptoms until members started to leave. On the other hand, I've also seen organizations turn member engagement around for the better simply by identifying the different types of members they have and creating strategies to engage each one. 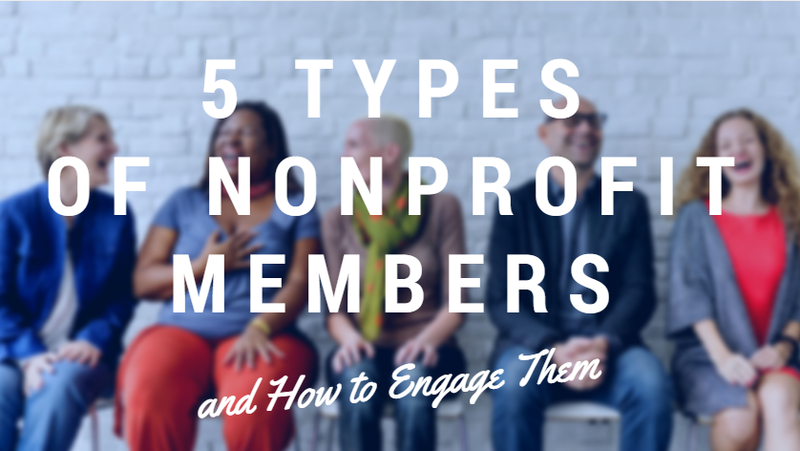 In this post, I'm going to cover the five most common nonprofit member types I've encountered and the strategies I’ve seen work best to engage them. Note: In creating this article, I spoke with over a dozen membership organizations — all customers of Wild Apricot's membership management software to discover their best tips. You recognize their faces, but can’t remember their names. They come to all of your nonprofit’s events, but it’s hard to get them to engage with other members. These members are also not likely to participate in a Q&A or share their opinions in a group setting, but they obviously support the cause because they keep attending your events, rain or shine. It’s important to remember that shy people are not necessarily introverts. Psychology Today notes that shy people may really want to engage with others, they just experience anxiety thinking about taking the first steps. This is where you can help in planning smaller, low-key introductions to help bring them out of their shells. Try kicking off some of your events a little earlier than planned with networking ice-breakers — fewer people in the room present could help your more reserved members feel more confident about opening up. If you are hosting a discussion, try breaking people into smaller groups. This allows individuals who may feel uncomfortable with public speaking interact with a handful of people right across the table from them. Pull the shy member aside and ask for a one-on-one, informal meeting to discuss a specific area that you know they are interested in. It’s possible you may find a trove of remote volunteer power or a behind-the-scenes professional—like an accountant or computer programmer—willing to do some heavy lifting outside of a collaborative work group. They can’t attend any events. You have never met them face-to-face, so you may not feel like they are as important as your local members. On top of this, if they are feeling disconnected, they are unlikely to let you know. The key to keeping them hooked is through providing a platform for effective communication — virtual lunches, e-newsletters, webinars, a private Facebook group, and online conferences are just a few ways you can increase the number of touchpoints with remote nonprofit members. In some ways, you may think about these members as “busy” people who don’t have time to join you in person — so how can you make sure they feel included? It all comes back to how much effort you put into communicating with them. In your online newsletter include info from members around the country, not just those who participate in local events. Offer an online member directory and forum so they can stay engaged with other members (this is something you can easily do with Wild Apricot’s membership website builder). Personalize your website and social media so remote members can stay connected there as well. I’ve seen some organizations allow members to write blog posts, lead their Facebook page for a week, or submit photos from local meetups around the country. Engagement is a two-way street, so if you can get them to engage you, you’re winning! Create an online forum where members can connect with each other. Facebook Groups is one option I see used quite often, but if your member base is quite large, another great tool is called Small World Community (SWC and Wild Apricot are both tools from the same company). What’s great about SWC the advanced analytics in the backend. Admins can see which members are engaging the most and how. There's even a point system to reward members for completing things online like filling in their profile, talking with other members, writing new posts, or liking others’ photos. Ask for input. Nonprofit Technology Network reminds us that compelling content can encourage members to act wherever they are — whether that’s by retweeting a post from your event or asking questions to get them to respond in the comments. Just because they can’t engage in person doesn’t mean they won’t feel like they are part of the organization. Your events tend to be a sea of salt and pepper hair, but you know you have younger members hiding somewhere... Unfortunately many organizations focus on offering services geared towards their mature members, since they are their bread and butter, while neglecting the needs of their younger members. Even if they aren’t coming to your events, younger members tend to be very active online. Check out our post The Ultimate Guide to Connecting With And Recruiting Younger Members for a wide range of tips to help better engage the 20-35 set. While these members may not seem as vital to your institution now, they are your future donors, and you should be engaging strongly with those on the upper end of that age bracket — perhaps even including them on your board — to help your organization avoid a generation gap. Stay active on social media — Facebook, Twitter, Instagram, and even Snapchat. Use pictures, tell real stories from your members, and share live video from events. To help keep your feeds current, utilize a program like Hootsuite or Social Oomph that will help you schedule posts. Another idea I've seen work well is to create a special group for younger members to interact with each other. Survey them to find out what topics they are most passionate about. Many organizations I’ve talked to use a mentorship program to help bridge the gap between their older and younger members. Socials work well to engage people of all ages. One organization I spoke with recently, a trader support group, noticed their events attendees increased 20% whenever they included a social as part of the mix. What's happening is that updating processes creates a lot of change for your members who are used to doing things a certain way for a long time. It can cause them to feel disconnected with what’s going on. Whenever you update a membership process, take a few extra moments to explain why you're doing it. For example, does the change save your organization more time or money? Does it create a way for your organization to grow, or communicate faster? Explaining the reasoning can help your older members feel more comfortable with accepting or making the change themselves. Make a list of all the concerns from your older members. Categorize them into groups and bring them up as an item of discussion at your next social. Ask the room for suggestions on how your organization should operate. Sometimes people just have the need to know their voice is being heard and this is one great way to do so. Another benefit from this is that it gives your older and younger members a chance to voice their opinions about a topic and see both sides of the coin. Keep live events a priority. Since older members are more likely to have the time to attend and volunteer, have them take the lead in engaging with one another to help share information. Since live events also take a lot of work. Ask some of these members to volunteer by taking minutes, organizing snacks, or setting up chairs. It can be easy to get caught up in the daily tasks of managing a members, and sometimes long-time members can become forgotten. To solve this, simply create a VIP membership level, awarded to those members who’ve been at your organization for five years, ten years, or however long you determine. What this does is create a way to continuously recognize these members for their loyalty and service to your organization. I’ve even see some organizations give their VIP members small perks like early access to purchasing event tickets, or special meet-and-greets before gatherings. One thing to remember — this age group is likely to be your most prominent financial backers, so do not let them slip through the cracks! This member is already super-engaged, so there is no problem. They're showing up to events, responding to messages, volunteering when they can, engaging with other members, and advocating for the organization. These are the members you wish all your members would be like. Find out what made them super-engaged in the first place and do more of it. This will help turn more of your current members into the super-engaged members these people are. Find out where they came from. You may notice some commonalities in how these members found your organization. With this information, you can devote more resources into finding more members like these. Use them to build your ‘ideal member’ profile. This profile is a list of traits that your super-engaged members have which can help everyone in the organization understand who to be on the lookout for. Then, when you see a new member who fits the profile, give them a special push to make a greater connection with the organization. Pair them with volunteer opportunities they are excited about, and check in regularly to see if they’re ready for a change so you avoid burnout or boredom. You may also want to consider offering your biggest team player a spot on your board. They are already super committed to advocating on your behalf, why not make use of their excitement? Don’t skip on the member/volunteer awards recognition ceremonies and gifts. These rockstars need to see how much they matter to the organization, so be sure to show them! When thinking about member profiles, the most important thing to keep in mind is that there is never a “one size fits all” approach when it comes to keeping your members engaged. Take the time to dig deep into your members' motivators, opportunities, barriers, and characteristics to tailor your engagement strategies for success.